This was written by Faye Parrish of Bunnell, Florida. Today I read of your administrations’ plan to re-define September 11 as a National Service Day. Sir, it’s time we had a talk. During one of your many speeches, Americans heard you say that you intended to visit all 57 states. We all know that Islam, not America has 57 states. Every time you apologized to other countries for America’s position on an issue we have wondered why you don’t share our pride in this great country… When you have heard foreign leaders berate our country and our beliefs, you have not defended us. In fact, you insulted the British Crown beyond belief. When your pastor of 20 years, “God-damned America” and said that 9/11 was “America’s chickens coming home to roost” and you denied having heard recriminations of that nature, we wondered how that could be. You later disassociated yourself from that church and Pastor Wright because it was politically expedient to do so. When you announced that you would transform America, we wondered why. With all her faults, America is the greatest country on earth. Sir, KEEP THIS IN MIND, “if not for America and the people who built her, you wouldn’t be sitting in the White House now.” Prior to your election to the highest office in this Country, you were a senator from Illinois and from what we can glean from the records available, not a very remarkable one. You are 14 months into your term and every morning millions of Americans wake up to a new horror heaped on us, by you. You seek to saddle working Americans with a health care/insurance reform package that, along with cap and trade, will bankrupt this nation. We seek, by protesting, to let our representatives know that we are not in favor of these crippling expenditures and we are labeled “un-American”, “racist”, “mob”. We wonder how we are supposed to let you know how frustrated we are. You have attempted to make our protests seem isolated and insignificant. Until your appointment, Americans had the right to speak out. September 11 is a day of remembrance for all Americans. You propose to make 9/11 a “National Service Day”. While we know that you don’t share our reverence for 9/11, we pray that history will report your proposal as what it is, a disgrace. We have noticed all these things. We will deal with you. When Americans come together again, it will be to remove you from office. Take notice. If you agree with this, please pass it on. If not, I’m sorry. Googling ‘Wall Street Journal Forum’ doesn’t bring up a specific webpage called that…. Just those words in various combinations…. So representing this as being printed in the Wall Street Journal is not accurate. I have this theory about Barack Obama. I think he’s led a kind of make-believe life in which money was provided and doors were opened because at some point early on somebody or some group took a look at this tall, good -looking, half-white, half-black, young man with an exotic African/Muslim name and concluded he could be guided toward a life in politics where his facile speaking skills could even put him in the White House. In a very real way, he has been a young man in a very big hurry. Who else do you know has written two memoirs before the age of 45? “Dreams of My Father” was published in 1995 when he was only 34 years old. The “Audacity of Hope” followed in 2006. If, indeed he did write them himself. There are some who think that his mentor and friend, Bill Ayers, a man who calls himself a “communist with a small ‘c'” was the real author. His political skills consisted of rarely voting on anything that might be deemed controversial… He went from a legislator in the Illinois legislature to the Senator from that state because he had the good fortune of having Mayor Daley’s formidable political machine at his disposal. Obama is a man who could deliver a snap judgment about a Boston police officer who arrested an “obstreperous” Harvard professor-friend, but would warn Americans against “jumping to conclusions” about a mass murderer at Fort Hood who shouted “Allahu Akbar.” The absurdity of that was lost on no one. He has since compounded this by calling the Christmas bomber “an isolated extremist” only to have to admit a day or two later that he was part of an al Qaeda plot. He is a man who could strive to close down our detention facility at Guantanamo even though those released were known to have returned to the battlefield against America… He could even instruct his Attorney General to afford the perpetrator of 9/11 a civil trial when no one else would ever even consider such an obscenity. And he is a man who could wait three days before having anything to say about the perpetrator of yet another terrorist attack on Americans and then have to elaborate on his remarks the following day because his first statement was so lame. 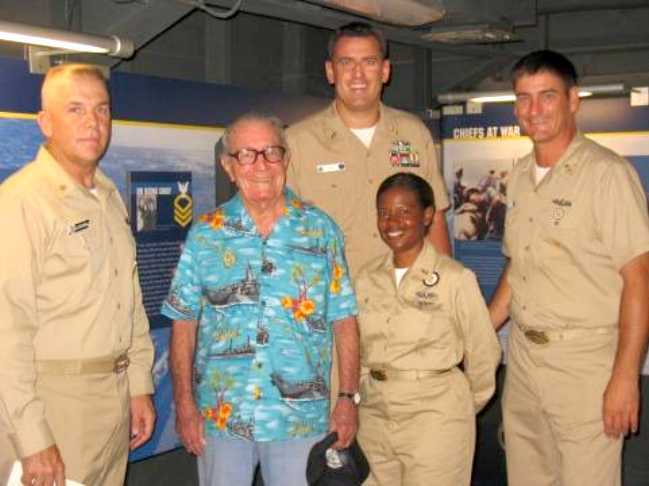 WW II Battleship Sailor tells Obama to shape up or ship out! This venerable and much honored WW II vet is well known in Hawaii for his seventy-plus years of service to patriotic organizations and causes all over the country. A humble man without a political bone in his body, he has never spoken out before about a government official, until now. He dictated this letter to a friend, signed it and mailed it to the president. I enlisted in the U.S. Navy in 1934 and served proudly before, during and after WW II, retiring as a Master Chief Bos’n Mate. Now I live in a “rest home” located on the western end of Pearl Harbor allowing me to keep alive the memories of 23 years of service to my country. I am amazed, angry and determined not to see my country die before I do but you seem hell bent not to grant me that wish. I’d say shame on the both of you, but I don’t think you like America nor do I see an ounce of gratefulness in anything you do for the obvious gifts this country has given you. To be without shame or gratefulness is a dangerous thing for a man sitting in the White House. Which ones did you mean? Was it the notion of personal liberty that 11,000 farmers and shopkeepers died for to win independence from the British? Or maybe the ideal that no man should be a slave to another man that 500,000 men died for in the Civil War? I hope you didn’t mean the ideal 470,000 fathers, brothers, husbands, and a lot of fellas I knew personally died for in WWII, because we felt real strongly about not letting any nation push us around because we stand for freedom. And just who do you think you are telling the American people not to jump to conclusions and condemn that Muslim major who killed 13 of his fellow soldiers and wounded dozens more. You mean you don’t want us to do what you did when that white cop used force to subdue that black college professor in Massachusetts who was putting up a fight? You don’t mind offending the police calling them stupid but you don’t want us to offend Muslim fanatics by calling them what they are, terrorists. One more thing… I realize you never served in the military and never had to defend your country with your life but you’re the Commander-in-Chief now, son. Do your job. When your battle-hardened field General asks you for 40,000 more troops to complete the mission, give them to him. But if you’re not in this fight to win, then get out. The life of one American soldier is not worth the best political strategy you’re thinking of. You’re not going to restore American greatness by bringing back our bloated economy. That’s not our greatest threat. Losing the heart and soul of who we are as Americans is our big fight now. And I sure as hell don’t want to think my president is the enemy in this final battle. When a 95 year old hero of the “the Greatest Generation” stands up and speaks out like this, I think we owe it to him to send his words to as many Americans as we can.